The lighting doesn't do justice to these radishes. But they are yellow, yes yellow. For a limited time we will have these at the Farmers Market. 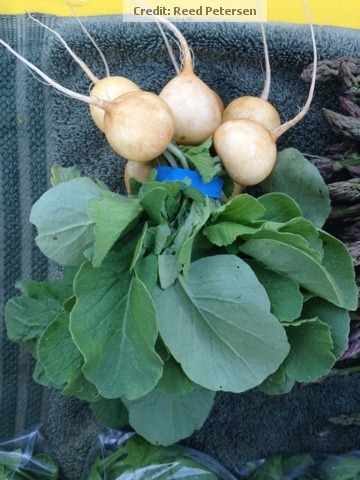 Reed says they are juicier than the normal red radishes, with a delicate bouquet. WHAT, these are radishes, not a fine wine. Well for a root expert like Reed, maybe there are some subtle things going on. Anyway if you want to try them we have them for a limited time. Nice picture Reed, this was from the market last week. I'll comment sometime on how to grow great radishes in the heat of the summer...that would be a strange concept with our cool rainy growing season so far. But we are getting there, just wait.